“`A newly discovered photograph suggests the iconic aviator Amelia Earhart, who vanished eighty years ago on a round-the-world flight, survived a crash in the Marshall Islands. The photo, found in an obscure file at the National Archives, shows a gal resembling Earhart, and a man who appears to be her navigator Fred Noonan on a dock. This new discovery is featured in a History Channel special, Amelia Earhart: The Lost Evidence, airing this Sunday. “`Independent analysts feel the photo appears legitimate and undoctored. A former executive assistant director for the FBI, and an NBC News analyst, has studied the visual evidence, and is confident it shows the famed pilot and her navigator. “`Earhart was last heard from on July 2, 1937, as she attempted to become the first female pilot to circumnavigate the Earth. She was declared dead, two years later, after the United States concluded she had crashed somewhere in the Pacific Ocean. Her remains were never found. But, investigators believe they’ve found evidence that suggests Earhart and Noonan were blown off course, and survived the ordeal. The investigative group behind the History special believes the photo may have been taken by someone who was spying for the United States on Japanese military activity in the Pacific. “`The photo shows a Japanese ship, Koshu, towing a barge with something that appears to be 38-feet-long — the same length as Earhart’s plane. For decades, locals have claimed they saw her plane crash, before she and Noonan were taken away. Native school kids insisted they saw Earhart in captivity. The story was even documented in postage stamps issued in the 1980s. “`The theory is that the Koshu took her to Saipan, in the Mariana Islands, and perished there under the custody of the Japanese. 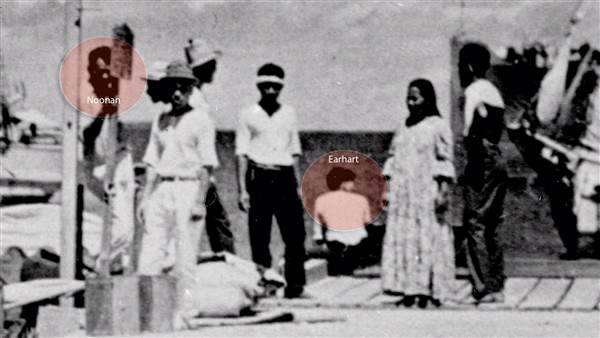 Authorities in Japan have told NBC News — they have no record of Earhart being in their custody. This entry was posted on Wednesday, July 5th, 2017 at 10:53 am	and is filed under Blog by Manny Pacheco. You can follow any comments to this post through the RSS 2.0 feed. Responses are currently closed, but you can trackback from your own site.